I’ll start by dating myself: I was a freshman in college in 1973-74, the year the first Dungeons & Dragons set came out; I’ve still got mine. That was also the year I learned to play Kingmaker. Kingmaker is set in 15th century England, during the Wars of the Roses; it’s very different from Star Traders, but philosophically very similar. Both are about rolling with unpredictable events and finding the most likely path to victory in an ever-changing arena. In the late ’70s I started playtesting for Metagaming, whose greatest claims to fame were Stellar Conquest and The Fantasy Trip (both great games). I didn’t test either of those, but I did test a few of their Microgames, including Artifact and One World. When Steve Jackson split off from Metagaming to form Steve Jackson Games, I started playtesting for him. That included several of his Pocket Games, and then larger games like Car Wars and Illuminati. By the early ’80s I was doing a lot of development and editing work on Car Wars and GURPS. 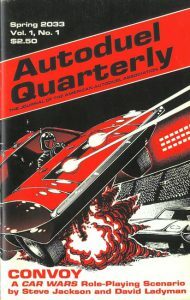 I edited the first few issues of Autoduel Quarterly (set in the fictional autodueling future) and was Car Wars and GURPS Guru for a while, responsible for system development of both series. I wrote a few Car Wars titles myself, including the AADA Vehicle Guides and the first Uncle Albert’s catalogs (ably assisted by my wife, Martha, in her persona as Uncle Al). Jim Gould and I puttogether the Advanced Collision System for Car Wars. 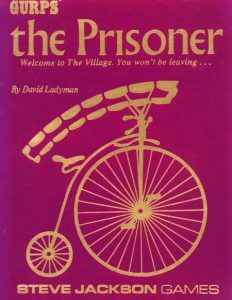 For GURPS, Mike Hurst and I worked out the Size-Range-Speed to-hit modifiers system, and I wrote one GURPS sourcebook: The Prisoner, based on the short-lived television series of the same name. This was also when I designed Star Traders. After SJG, I developed and edited a few AD&D modules and spent a couple of years working with FASA, on Renegade Legion and Battletech rulebooks, sourcebooks and scenario packs. And about this same time, I created the language relationship table, first for Justice Inc., and then for the rest of the Hero System line that is better known for Champions. The month my contract with FASA ended, I was hired by Origin Systems as their first (and only) Publications Manager. For almost seven years, my name went on every product that Origin published, since my team created all its manuals and game guides during that time. I had a great team, including Melissa Tyler, Tuesday Frase, Chris McCubbin and Jennifer Spohrer, with Wendi Dunn and Lisa Goodrich on layout. That includes all the Ultima products between U7 and U9, and the first few iterations of Ultima Online. It included all the Wing Commanders after WC1. And we created mega-manuals for all the Jane’s products that Origin designed, including Apache Longbow and USAF. We also did game guides for Bullfrog, a sister company once Electronic Arts acquired both of us. Electronic Arts decided to close down the Publications department at Origin, and so the five of us formed IMGS, Inc. and continued creating manuals and game guides, most often for Prima games. We somewhat specialized in massive online games, and in the late ’90s and early ’00s we created books for Anarchy Online, Asheron’s Call, City of Heroes, Dark Age of Camelot, Everquest I and II, Lineage II, The Matrix Online, Star Wars Galaxies, and Ultima Online. Plus plenty of other titles. Available jobs declined sharply in the latter half of the decade, and eventually I was the only one left at IMGS. I continued doing manuals, for Rift, DC Universe Online, Fallen Earth, The Lord of the Rings Online, Saga of Ryzom, and others. I created manuals for lots of different smaller games and other companies. One major project during this period was the Game Development Essentials textbook series that Jeannie Novak created, for which I did layout and media clearance. I also created You Are There, a series of Bible workbooks for teens, again with Martha, and that’s how Ryan and I started working together — he illustrated them for us. Shortly after we finished the You Are There series, Cloud Imperium launched their now-famous Star Citizen Kickstarter campaign, and a month or two later, Chris Roberts asked me to do Jump Point, the monthly PDF magazine for subscribers. Ryan ended up working with me on several print and PDF brochures for CIG, and so we were very familiar with each other’s work when he agreed to help with Star Traders; it couldn’t have happened without him.